If we're going to deal with cold weather, we might as well get snow! A cold winter-like pattern has moved over the eastern U.S. and Mid-South this week as we head towards the first few days of March. And if you know Mid-South weather or have listened to MWN for any length of time, you know we don't rule out winter weather, even some snow, around the first of March. It looks like we'll once again have a shot at wintry precip as March comes in like a lion! 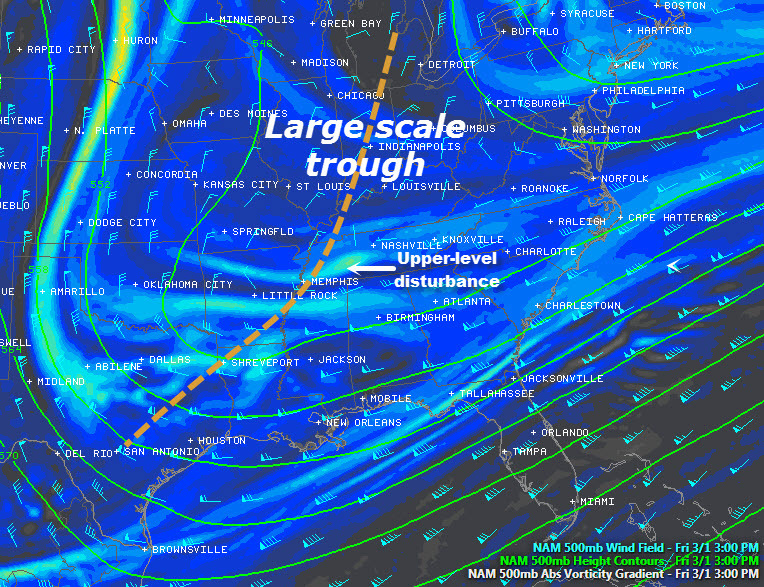 A large-scale upper level trough dominates the eastern U.S. weather pattern which has allowed cold Canadian air to drop south into the Mid-South. Upper level disturbances rotating through the trough have brought light rain a couple of times the past few days, but mostly they have maintained cloud cover, which has kept temperatures very cool. As cold air continues to pour in for another couple of days, it's gotten cold enough aloft that the next disturbance will bring precipitation that will likely contain some light snow! A huge trough over the eastern U.S. has provided a conveyor for disturbances to rotate through. We expect this chance of precipitation to move into the area Friday afternoon into Friday night. While surface temperatures should be just warm enough in the afternoon (lower 40s) to produce light rain, by evening temps will be cooling into the 30s and precip should change over to light snow. The best chance for any accumulating snow will be during the evening hours Friday, though flurries will be possible all night into early Saturday. The amount of precipitation is expected to be light, so anything more than a dusting of snow is not expected in the metro, but there is potential for up to 1/4" to 1/2" of snow Friday night. By Saturday afternoon we should begin to see some sun and Sunday will be mostly sunny but still cold with highs in the lower 40s. A warming trend starts the first of next week with another chance of rain on Monday night. We'll continue to keep an eye on the computer models and update our snow chances and forecast amounts via our social channels listed below as well as in the MWN Forecast. Overall, this is not a big snow threat, but maybe a nice way to END winter! We can only hope! At mid-afternoon, the metro is dry with some places, especially over north MS, getting some sunshine this afternoon. Not quite the picture the forecast painted this morning! Despite the lack of expected rain today, showers and thunderstorms ARE still on track for tonight. As of 2pm, the Storm Prediction Center added a large part of southern and central AR and parts of northwest MS to a Slight Risk zone for an enhanced severe weather threat this evening (see below). While severe storms are not expected in the metro, a few storms that move out of AR could bring some small hail or gusty wind to 40-45 mph, mainly in the 8pm-midnight time frame. A strong low level jet stream of 50-60 mph will be blowing through the storms at 2000-3000 feet above the ground. Some of this wind could be transferred down towards the ground in some storms, producing a minor wind damage threat. However, the main threat, especially over AR, will be hail due to very cold air aloft that is escorting an upper level low pressure system that will move overhead early Saturday morning. In addition, very heavy rain is expected as the showers and storms move though. Regional radar at mid-afternoon (below) shows storms organizing to our southwest that will lift northeast into the region during the evening. MWN will be nowcasting the storms this evening on Facebook and Twitter. Tune into the links below for the latest on tonight's storms, including the MWN mobile app with StormView Radar and StormWatch+ severe weather notification (should any warnings be issued). Behind tonight's storms, the upper-level energy from this system will move through Tuesday morning bringing scattered showers. Temperatures tomorrow will be tempered by clouds and precipitation with highs just above 50. Slightly cooler weather moves in for mid week with highs in the upper 40s, then a blast of cold air arrives from Canada for late week, resulting in even cooler temperatures. Though a few sprinkles or flurries are possible Friday or Saturday, this is not the type of cold air pattern that traditionally brings significant snow chances. Sorry snow-lovers! Click here for the complete MWN Forecast. A primary source of weather information is the Emergency Alert System (EAS). EAS is a system of communications links that utilize data in a digital form. It is a reliable means of linking the National Weather Service, Emergency Management agencies, and the radio and television broadcast media together. EAS helps participating radio and television stations receive and relay weather warnings, and other emergency information in a timely manner. 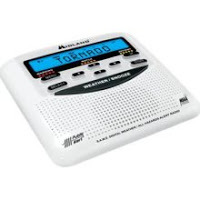 MemphisWeather.net strongly encourages every home to have a NOAA Weather Radio. These devices are as important as smoke detectors and possess the same capability to save your life in the middle of the night. Specifically, our favorites are from Midland and include the basic desktop version (WR-120). It can be picked up at retailers such as Radio Shack, Walgreens, Kroger, and other discount stores, as well as online retailers like Amazon. Learn more about NOAA Weather Radio on MWN's Weather Radio page. One problem (if you can call it that) with Weather Radio and warnings sirens for that matter is that they alert on a COUNTY-wide basis, even if the warning issued by the National Weather Service is for only a small portion of the county. To know if YOUR LOCATION is in the warned area, we highly recommend our latest weather warning product, StormWatch+. StormWatch+ pairs the NWS polygons (or warning boxes that are drawn irrespective of county borders) with your GPS-provided location to send push notifications in the event that YOU are in harm's way. No more alerts when the storm is 20-30 miles away and not a threat to your area! Learn more about StormWatch+ at StormWatchPlus.com and get personalized weather alerts in the palm of your hand! Earlier this evening, NEXRAD radar picked up a set of low level gravity waves as they moved through the metro head of a cold front. A side-by-side radar screenshot is shown below with the waves marked in the velocity (wind) data. The waves existed in the lowest ~1,000' of the atmosphere. Gravity wave are basically vertical motion, or "waves," in a stable layer of air. Think of ripples created in a still pond when you throw a pebble in. Water is displaced by the pebble and mini waves are created. As teh ripples, or waves, propagate out, they become smaller as equilibrium is reached. Atmospheric waves are vertical displacement of air up and down caused by something that forced the air to rise in the first place (typically thunderstorms). Even after the source of the waves (i.e., the thunderstorms) dissipate, the waves can propagate downstream. Just like ripples in a pond that get smaller as they propagate out, gravity waves eventually get weaker and dissipate altogether. 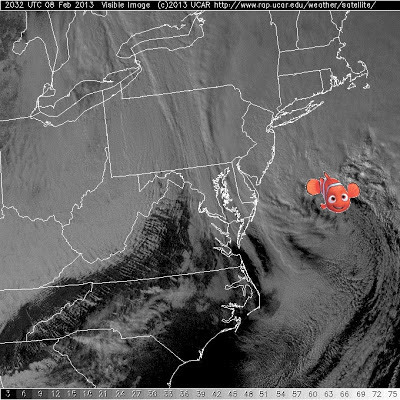 The waves are identifiable on radar because they cause the wind to shift direction at the level where the waves exist. In tonight's case, the waves existed from very low levels up to about 1,000' and, in fact, the wind direction switched from east to west and back to east again at MemphisWeather.net as they passed over (over many minutes). These rising portion of these waves also can cause clouds and precipitation, while the sinking air promotes clear (or less cloudy) skies, just like low pressure and high pressure, respectively. Looking at the precipitation panel in the image above (left side), you can faintly make out "waves" of enhanced reflectivity as blues and greens. These enhancements are clouds and light rain caused by the rising air associated with the waves! So, next time "gravity waves" are mentioned in weather discussion, you'll know what they are! 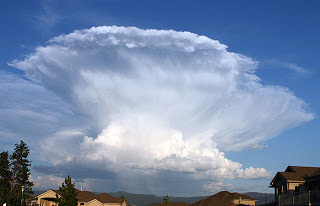 Here's another post that explains how gravity waves caused thunderstorms to erupt over the metro on July 4, 2011, as well as a cool video of waves in action in a cloud timelapse. Floods and flash floods occur every year in the Mid South. River flooding occurs seasonally when winter or spring rains or torrential rains associated with tropical storms fill river basins with too much water too quickly. 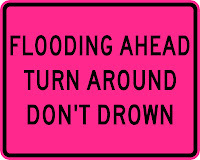 Flash floods occur suddenly, usually occurring withn hours of excessive localized rainfall. These flash floods can become raging torrents which rip through river beds, urban streets, or valleys sweeping everything before them. 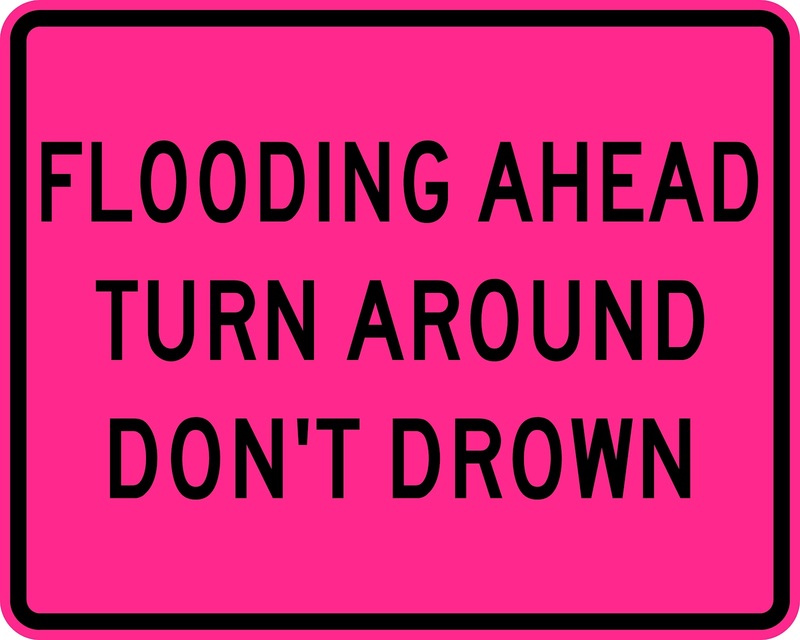 When a Flash Flood Warning is issued for your county, or the moment you first realize that a flash flood is imminent, act quickly to save yourself. You may only have seconds. 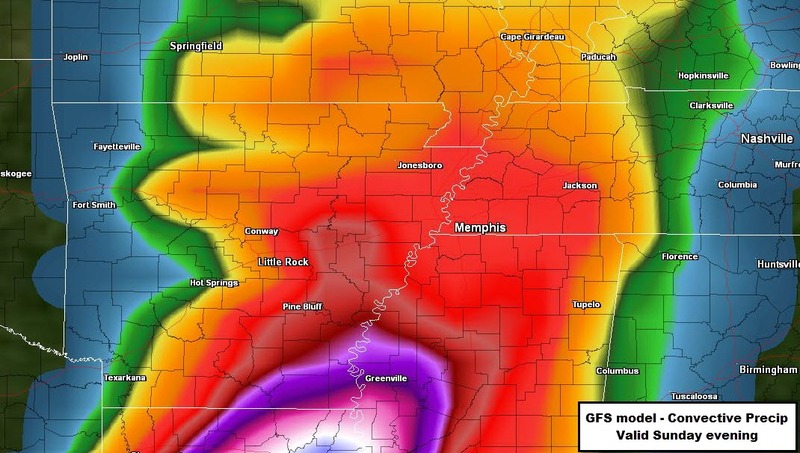 MemphisWeather.net has you covered during potential and ongoing floods and flash floods via the MWN Flood Center, which includes current radar and estimated precipitation totals, precipitation forecasts (amounts and timing), and river levels and forecasts. In addition, StormWatch+, available via the MemphisWeather.net mobile apps for Android and iPhone, will alert you if you are in an area that is under a Flash Flood Watch or Warning. MWN has partnered with Take Cover Storm Shelters to keep Mid-South residents safe in the path of the storm. We have become very familiar with Take Cover's high-quality product, as well as their outstanding customer service, and have no reservations about endorsing this fantastic company. You can learn more about Take Cover and their in-ground shelters, which are installed in a concrete slab such as a garage floor, at their website or on Facebook. Be sure to mention MemphisWeather.net when you contact Jessica! In addition, a personal warning device that only alerts you if YOUR location is in the path of a dangerous storm is a must have. We encourage you to add StormWatch+ to your MemphisWeather.net app. It will wake you up at night for the most dangerous situations and allow you to customize exactly what locations you want to be alerted for and what types of alerts to receive, as well as when you don't want to be bothered. 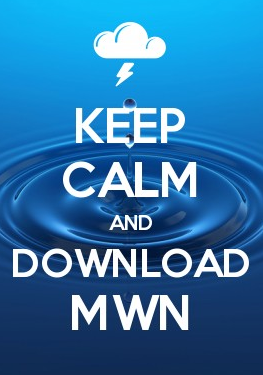 The MWN mobile app is available for iPhone as well as Android devices. Move inside a well constructed house, a large building, or an all metal vehicle. Stay away from electrical appliances and do not use the telephone. Global lightning frequency shows what parts of the world see the most lightning annually. For most weather providers (especially the small fish like us), lightning data is one piece of weather information that can be hard to come by (especially in realtime). There are only a couple of providers of commercial lightning data in the U.S., which makes re-distributing the data cost-prohibitive for all but the largest commercial vendors. That is why you won't find lightning data on MWN. However, the colors of the echoes on radar indicate the relative severity of the storm. On StormView Radar, anything colored orange, red, or higher has a fairly high likelihood of containing lightning. As we nowcast on Facebook and Twitter, we'll also be sure to let you know if a storm is electrified so that you may adjust your plans if necessary to maintain your safety. While Tornado Alley may be the Hollywood backdrop for storm-chasing worthy tornado action, those of us living in the south know that Tornado Alley's redneck cousin, Dixie Alley, is where the real action is when it comes to deadly tornadoes! In fact, statistics show that Dixie Alley is where the majority of killer events occur. The graphics below show that, while the frequency of tornadoes is highest across the Plains from the Corn Belt to north Texas, killer tornadoes are most likely in the Mid-South and Tennessee Valley. 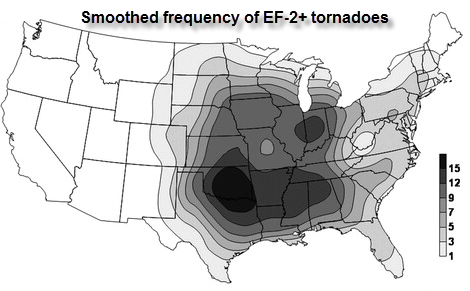 In fact, the highest frequency of significant (EF-2+) tornadoes stretches from a peak in the Red River Valley east into the mid-lower Mississippi Valley, including the Mid-South. In light of the statistics above, here are 11 reasons why Dixie Alley tornadoes, as compared to those in Tornado Alley, are more insidious (in no particular order). 1. 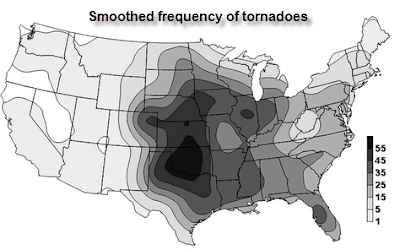 High frequency overall - While Tornado Alley boasts the greatest number of overall tornadoes in the nation, and perhaps the world, the south is no slouch. And in fact, when considering "significant tornadoes" (EF-2+), Dixie Alley and the Mid-South in particular are just behind Oklahoma and the Red River Valley and exceed most of the Plain states. The average annual number of tornadoes in Dixie Alley per 10,000 square miles is 6-9+, rivaling just about any other area in the nation. 2. Frequency of nocturnal tornadoes - Just about anyone living in Dixie Alley for any length of time can tell you that the sound of tornado sirens wailing or Weather Radios screeching in the middle of the night is enough to either frighten or frustrate nearly everyone, especially when it occurs on a relatively frequent basis. 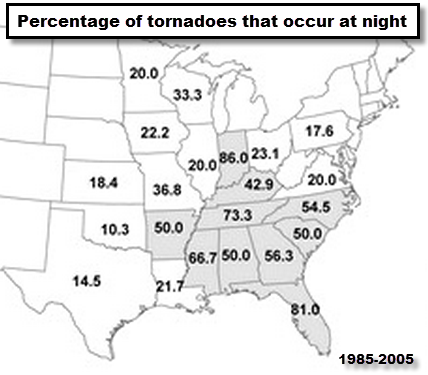 In fact, AR, TN, MS, and AL all have 50% or more of their tornado deaths at night, with TN at 73.3%! Due to the likelihood of more tornadoes in transitions seasons (more in #3 below) than other areas, more tornadoes also occur after dark. When is the most likely time to die in a tornado? When you can't see it coming or are sleeping through a warning (at least until it's too late). 3. 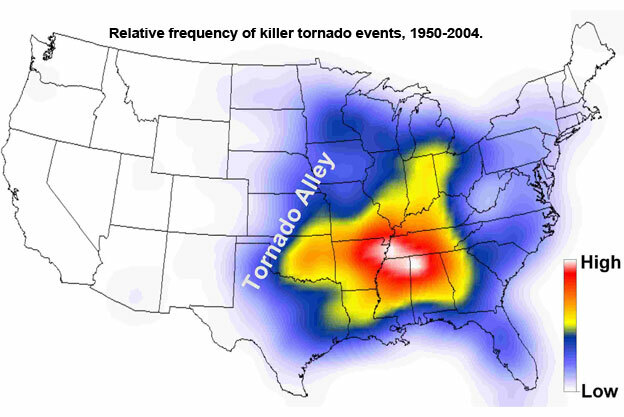 No well-defined tornado season - Alluded to above, unlike Tornado Alley when tornadoes are generally concentrated during "tornado season" from roughly April-June, Dixie Alley sees an abundance of tornadic storms in the "cool" or transitions seasons. In fact, there is a notable severe weather peak (albeit lower than spring time) in November and early December in the South that exists nowhere else in the U.S. However, it is not unusual (despite post-storm media reports to the contrary) to see tornadoes in winter and even summer (one of the best "off-season" examples being the Super Tuesday Outbreak of February 2008). When tornado season is spread out over the course of the year, preparedness and awareness tend to be low. In Tornado Alley, the preparedness level in the spring is at an all-time high. 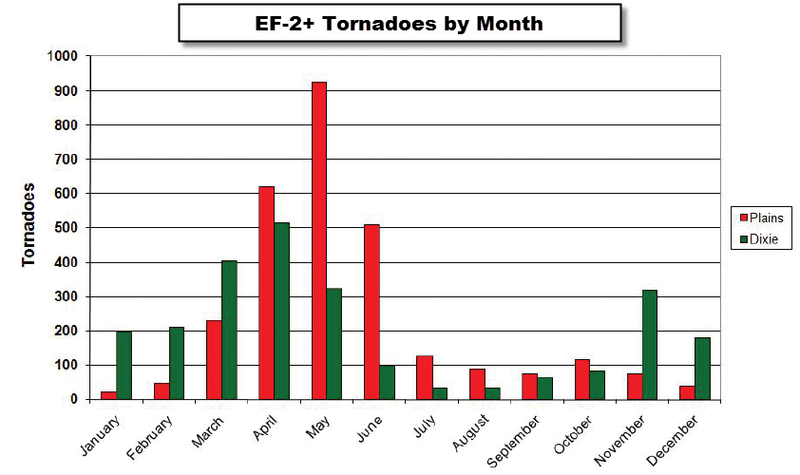 Comparison of strong & violent tornadoes by month for Tornado Alley (red) and Dixie Alley (green). Gagan et al, 2010. 4. Fast storm motion - Because of the nature of Dixie Alley storms to occur more often in the spring and fall, the storms that develop tend to be pushed by a stronger jet stream than in the late spring/summer when jet streams are typically less vivacious. A stronger jet results in faster moving storms. Faster moving storms mean A) less time for forecasters to react and warn the public (though southern meteorologists take this into account and by and large do a fantastic job at providing excellent lead time) and B) less time for the public to process the threat and respond accordingly. When a tornado is moving at 40-50+ mph, it doesn't take long to cross the typical county and residents must be ready to take cover when the warning is issued. Some of the videos of Dixie Alley tornadoes appear to be time-lapsed when in reality the funnels really are moving THAT fast! 5. Rain-wrapped funnels - This refers to the nature of southern tornadoes to tend to be less "visible" to the public due to having rain surrounding the funnel. In Tornado Alley, moisture is often not nearly as abundant as in the South, where southerly wind off the generous Gulf of Mexico provides ample moisture for heavy rainfall. In addition, higher low level humidity also means lower cloud bases. These factors result in tornadoes in the Plains that are "picturesque," with their funnels easily identifiable from a long distance, while in Dixie Alley, what appears to be a heavy shower could actually be masking a deadly swirl of air lurking inside. Where's the tornado? (Hint: where the transformer is blowing.) Photo credit: Dr. William T. Hark. 6. Terrain / trees - The South loves it's trees. They're everywhere and they make for great scenery, ample lumber, and cool shade in unbearably hot and humid summers. Hilly terrain (at least moreso than the Plains - outside of the Mississippi Delta region) also provides for scenic Sunday drives and interesting local effects on the weather. 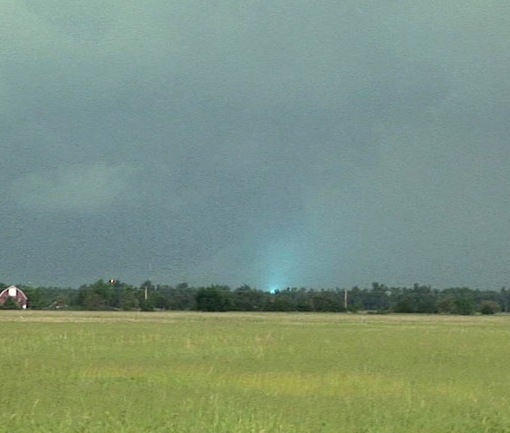 However, vegetation and terrain also make for a great game of hide-and-seek with tornadoes. Visibility, as in #5, significantly affects the ability to survive a twister. Nearby tornado hidden by trees, Photo credit in image. 7. High population density - While it may seem that there are lots of rural areas in the South, when compared to the miles upon miles of deserted farm and pasture land of the Plains, the population density of Dixie Alley is actually much higher than in Tornado Alley. If a tornado touches down in the middle of nowhere in Kansas and no chasers are there to record it, does it even count? Try doing that in the South. If it's not brushing up against a mid-size or larger city, there are likely at least 2-3 hamlets or single-stoplight towns in the path. 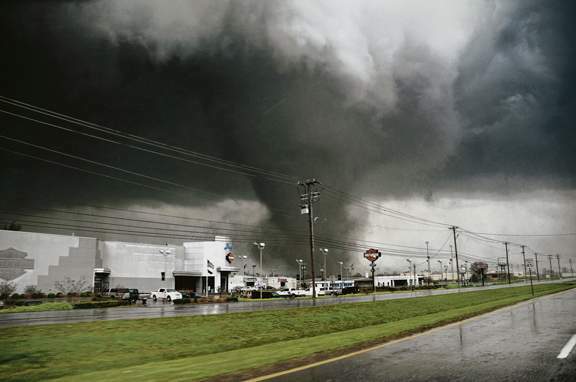 Bottom line: nearly every tornado in Dixie Alley will affect SOMEBODY. 8. Low quality construction - Hate to say it, but it's a fact. Housing stock in the southeast U.S. is, on average, poorer than the Plains. 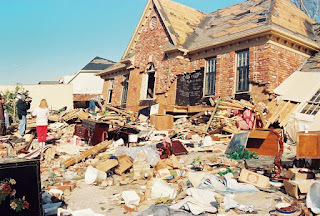 In particular, the abundance of mobile homes, manufactured homes, or trailers (or whatever you want to call them), means that even the weakest tornadoes can wreak havoc on the occupants of one of these dwellings. 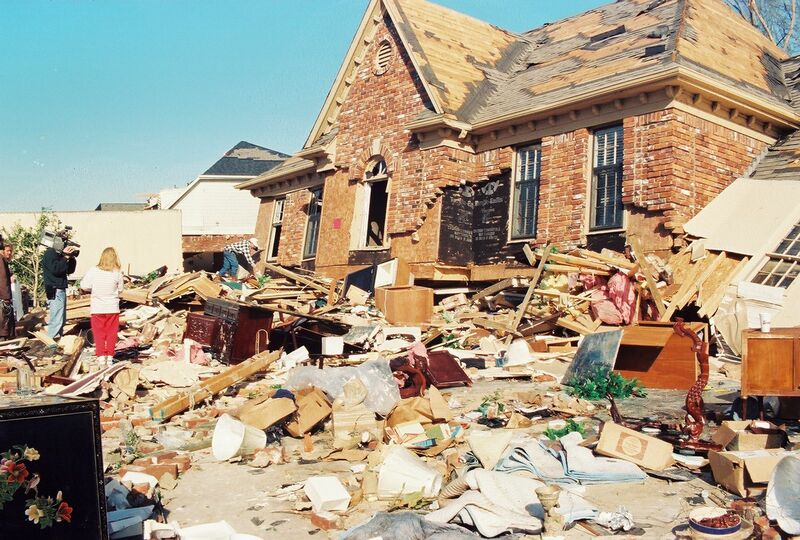 Here are the facts: from 2001-2005, nearly 57% of all tornado fatalities occurred in non-permanent housing and the number has consistently been rising. Stick-built, or permanent, houses accounted for just over 25% of tornado deaths. 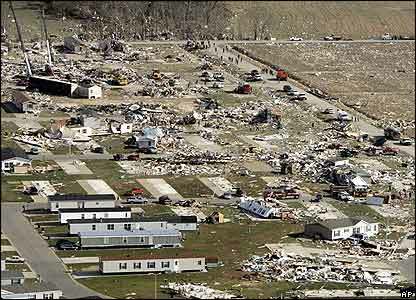 In AR, AL, GA, MS, and TN from 1985-2005, 52% of all tornado deaths occurred in mobile homes. Add to that that the southeast U.S. has the highest percentage of mobile homes east of the Rockies and you have a recipe for disaster. More mobile homes = more death. Mobile home park after a tornado. Photo credit: http://thetornadoallie.blogspot.com. 9. Lack of basements and storm shelters - Anecdotally, we know that there are very few underground places of shelter in the southeast. Due primarily to construction costs among other factors, basements are very rare. In addition, storm shelters are also rare, likely due to their relatively high cost as compared to demographics. In Tornado Alley, a large percentage of the population has either a basement or a storm shelter. Some tornadoes are only survivable if you are underground, plain and simple. Even the most well-constructed homes are Lincoln Logs to an EF-4/5. Germantown, TN tornado, originally posted on the MWN Blog. Photo credit: Edgar Babian. 10. Demographics - It is what it is. The "social vulnerability" of those living in Dixie Alley is higher than in other tornado-prone areas of the country. Poverty is higher (which likely factors into #8 above) and the age of the populace is higher. Both likely contribute to the fatality rate. 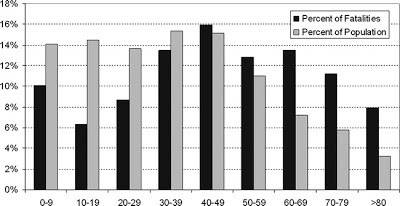 In fact, the percentage of tornado fatalities of those over age 50 is higher than the percent of the population of that age, suggesting that older people are more vulnerable. 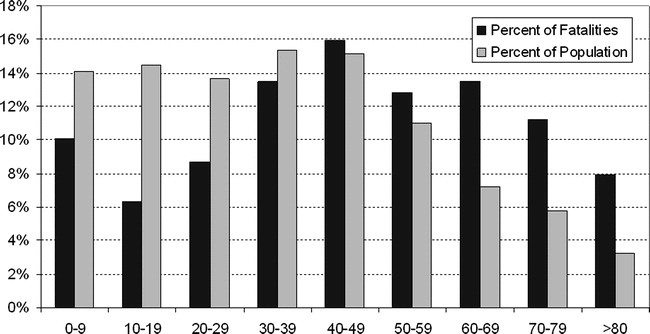 On the other hand, the percentage of tornado deaths of those under 30 is much lower than the percentage of the population in those age brackets, meaning younger people tend to do a better job of heeding the storms and sheltering appropriately. Percentage of tornado fatalities vs general population by age. Ashley 2007. 11. Apathy - Perhaps the hardest, and easiest, reason to understand, there's no getting the fact that we tend to be apathetic. "It'll never happen to me." "The sirens are always sounding." "Tornadoes don't happen at this time of year/day." Helen Keller said, "Science may have found a cure for most evils; but it has found no remedy for the worst of them all - the apathy of human beings." True, the false alarm rate for tornado warnings is high - but which would you rather have, a few extra warnings or one that truly does his "without warning?" The science is improving and false alarms are decreasing, but we have to counter apathy with education and information. Mississippi, Alabama, and Tennessee lead the nation in terms of tornado deaths per square kilometer AND killer tornadoes per square kilometer. Most of the other states in Dixie Alley also have averages well above the rest of the nation. While we don't see as many tornadoes by sheer number, Dixie Alley is the most vulnerable part of the nation when it comes to severe weather, due to all of the factors described above. Most of these factors won't change, but an apathetic populace is inexcusable. The National Weather Service offices across the south know exactly what they are dealing with and do a fantastic job warning the public when severe weather is possible, sometimes days in advance. Every home must have a NOAA Weather Radio programmed for the county in which it resides. We need to stop relying on outdoor sirens to be the sole warning of impending storms. Technology now allows us to reduce apathy by targeting warnings to those in the path of the storm. Our mission at MemphisWeather.net and Cirrus Weather Solutions is to do whatever we can to get the body count down and the awareness up. Whether you use our services, or someone else's makes no difference to us. But the information is there. It's time to put on your big boy/girl pants and make sure that you survive the next tornado! THERE ARE APPROXIMATELY TWO THOUSAND THUNDERSTORMS IN PROGRESS AROUND THE WORLD AT ANY GIVEN TIME. MOST OF THESE STORMS ARE BENEFICIAL AND BRING NEEDED RAIN. ONLY A SMALL FRACTION LESS THAN ONE PERCENT ARE CLASSIFIED AS SEVERE. SEVERE THUNDERSTORMS ARE THOSE THUNDERSTORMS THAT PRODUCE HAIL ONE INCH IN DIAMETER OR LARGER AND/OR STRONG WIND GUSTS OF 58 MPH OR GREATER. HAIL THAT IS ONE INCH IN DIAMETER IS ABOUT THE SIZE OF A QUARTER. WHEN A SEVERE THUNDERSTORM WARNING IS ISSUED FOR YOUR LOCATION... TREAT IT THE SAME AS YOU WOULD A TORNADO WARNING. SEVERE THUNDERSTORMS CAN PRODUCE DAMAGING WINDS... LARGE HAIL AND DEADLY LIGHTNING. MemphisWeather.net's "Storm Center" is your one-stop shop for severe weather information. The MWN Storm Center includes Mid-South radar, a clickable watch/warning map that updates as new alerts are issued by the NWS, recent storm reports, maps outlining severe risk areas from the severe weather experts at the Storm Prediction Center, and severe weather safety tips. If you are looking for information on severe weather in the Mid-South, the MWN Storm Center is the place to start! A progressive pattern is emerging over the Mid-South for at least the next week, promising multiple cold fronts and at least one potential chance for severe weather. Just in time for Severe Weather Awareness Week! As a huge trough shifts east and takes the cold weather of the past couple of days with it, southerly wind is returning to the area and will set the atmosphere up for our next cold front, which arrives Monday evening. Warm air ahead of it, moisture from the Gulf of Mexico, and lifting provided by the front will bring showers and thunderstorms to the area on Monday afternoon and evening. However, due to the recent cool spell, it does not appear that the atmosphere will have enough time to "recover" to fuel severe thunderstorms. In general, we expect periods of heavy rain and some thunder and lightning from late afternoon through the evening hours, and gusty south wind throughout the day Monday ahead of the front. A cold front approaching at 6pm Monday night provides the lift for thunderstorms across the region. A couple of dry days are expected Tuesday and Wednesday as high pressure builds in behind the front, then moves east and once again starts bringing in moisture and warmth on southerly wind. The second round of storms expected this week will be on Thursday. While details are still sketchy, the timing of this system could be similar to Monday's and the potential for severe weather looks higher than Monday. The dynamics of the system look stronger as the low pressure center dragging the cold front through will be much closer to the Mid-South than Monday. 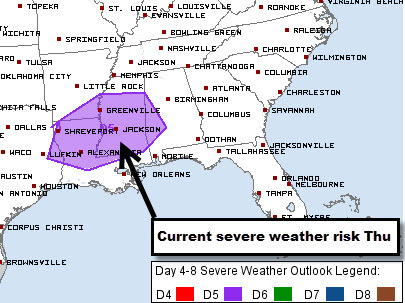 The Storm Prediction Center has been monitoring this system for a few days and highlights a portion of the Lower Mississippi River Valley, south of the metro, for the possibility of a squall line of storms preceded by supercells with possible tornadoes. We'll be sure to provide updated information as the date draws closer. 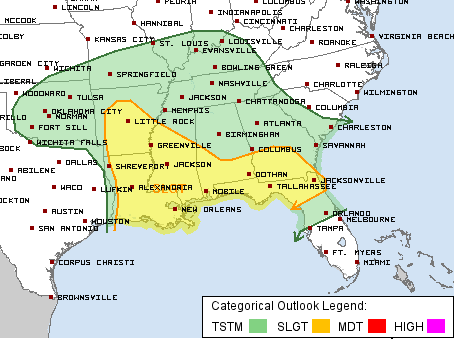 SPC is monitoring the Lower MS Valley for the potential of severe weather Thursday. The highlighted area can and will change by then. All Mid-Southerners need to remain alert to possible changes. However, with the possibility of strong storms later in the week, please be paying attention to the severe weather safety tips we provide throughout this Severe Weather Awareness Week. A tornado drill is scheduled for Wednesday and we'll host a Google+ Hangout training session on Tuesday night on #mSpotter - our Twitter-based severe weather spotting program that we partner with the NWS on. Be sure to join us! All the details on the week's activities, including some awesome giveaways, are posted on our Severe Weather Awareness Week page, as well as posts on Facebook, Twitter, and Google+. We also want to provide you the opportunity to have the technology available to keep you safe during severe weather. So, to honor awareness week, we have discounted our StormWatch+ service by 33%! Check it out in the MWN mobile apps for iPhone and Android devices (links below). 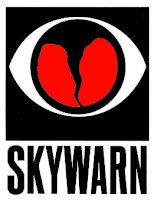 SKYWARN IS A PROGRAM DEVELOPED BY THE NATIONAL WEATHER SERVICE TO RECRUIT AND TRAIN STORM SPOTTERS. SKYWARN SPOTTERS ENHANCE THE NATIONAL WEATHER SERVICE STORM DETECTION CAPABILITIES BY IDENTIFYING AND REPORTING POTENTIALLY DANGEROUS WEATHER CONDITIONS. 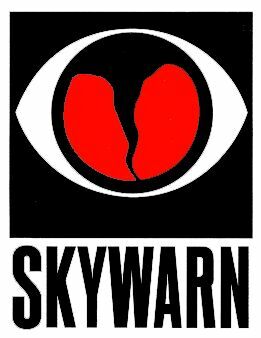 THE SKYWARN PROGRAM HAS BECOME AN INVALUABLE LINK IN THE NATIONAL WEATHER SERVICE WARNING PROCESS. DESPITE ALL THE SOPHISTICATED TECHNOLOGY USED IN A MODERN NATIONAL WEATHER SERVICE OFFICE... FORECASTERS STILL RELY ON STORM SPOTTERS. DOPPLER RADAR MAY INDICATE THAT A STORM MAY BE PRODUCING LARGE HAIL... DAMAGING WINDS... OR EVEN A TORNADO... BUT IT CANNOT TELL EXACTLY WHAT IS HAPPENING ON THE GROUND UNDERNEATH THE STORM. STORM SPOTTERS... TRAINED BY NATIONAL WEATHER SERVICE METEOROLOGISTS... ACT AS THE EYES AND EARS OF THE NATIONAL WEATHER SERVICE. THEIR REPORTS... RADAR DATA... AND OTHER INFORMATION RESULT IN THE MOST TIMELY AND ACCURATE WARNINGS POSSIBLE. SKYWARN SPOTTERS COME FROM ALL WALKS OF LIFE - LAW ENFORCEMENT... FIRE OR EMERGENCY MANAGEMENT AGENCIES... AND CITIZENS INTERESTED IN HELPING THEIR COMMUNITIES. A LARGE NUMBER OF STORM SPOTTERS ARE AMATEUR RADIO OPERATORS WHO VOLUNTEER THEIR TIME AND EQUIPMENT TO HELP THE NATIONAL WEATHER SERVICE DETECT AND TRACK SEVERE STORMS. AMATEUR RADIO OPERATORS WILL FREQUENTLY OPERATE RADIO EQUIPMENT AT THE NATIONAL WEATHER SERVICE OFFICE... GATHERING REPORTS FROM SPOTTERS IN THE FIELD AND RELAYING THE DATA DIRECTLY TO NATIONAL WEATHER SERVICE FORECASTERS. SKYWARN SPOTTERS ARE VOLUNTEERS... THEY RECEIVE NO COMPENSATION FOR THEIR HARD WORK. THEY DO... HOWEVER... HAVE THE SATISFACTION OF KNOWING THAT THEIR REPORTS RESULT IN BETTER WARNINGS WHICH SAVE LIVES. WHO IS ELIGIBLE TO BE A SPOTTER? THE NATIONAL WEATHER SERVICE ENCOURAGES ANYONE WITH AN INTEREST IN PUBLIC SERVICE AND ACCESS TO COMMUNICATION... SUCH AS AMATEUR RADIO... TO JOIN THE SKYWARN PROGRAM. VOLUNTEERS INCLUDE POLICE AND FIRE PERSONNEL... DISPATCHERS... EMS... PUBLIC UTILITY WORKERS... AND OTHER CONCERNED PRIVATE CITIZENS. INDIVIDUALS AFFILIATED WITH HOSPITALS... SCHOOLS... CHURCHES... NURSING HOMES... OR WHO HAVE A RESPONSIBILITY FOR PROTECTING OTHERS ARE ALSO ENCOURAGED TO BECOME A SPOTTER. HOW CAN YOU GET INVOLVED? YOU CAN PARTICIPATE IN THE SKYWARN PROGRAM BY ATTENDING A STORM SPOTTER TRAINING CLASS TO BECOME A TRAINED SPOTTER. EACH OF THE TRAINING SESSIONS IS FREE... LAST AROUND TWO HOURS... AND COVERS THE FOLLOWING CONCEPTS: BASICS OF THUNDERSTORM DEVELOPMENT... FUNDAMENTALS OF STORM STRUCTURE... IDENTIFYING POTENTIAL SEVERE WEATHER FEATURES... WHAT INFORMATION TO REPORT... HOW TO REPORT... AND BASIC SEVERE WEATHER SAFETY. In addition to SKYWARN, Memphians can use the power and immediacy of Twitter to report severe weather. Just send a tweet of what you see with the #mSpotter hashtag and the report will be passed directly on to NWS-Memphis meteorologists. The best reports include a geo-tagged tweet and picture of the severe weather (storm damage, hail, funnel/tornado, or even winter weather). For more information on this valuable program, visit the MWN #mSpotter page (mobile link) or join our Google+ Hangout for a training session on Tuesday night at 8:30pm. The annual Memphis SKYWARN spotter training class, which is free and open to the public, will be taught by the National Weather Service on Tuesday, March 26, at 6:30pm at Lord of Life Lutheran on Poplar Pike near Kirby Parkway. All current SKYWARN volunteers should attend as a refresher, while new volunteers are strongly encouraged to attend and learn how to be a spotter, what to look for, and how to report. 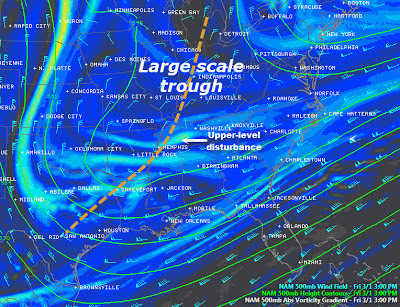 A large trough is developing over the central U.S. as an upper level pattern shift takes place. Low pressure will move out of the Front Range tonight into the Northern Plains by Sunday evening, dragging a cold front into the Mid-South during the afternoon. Though dewpoints are only in the 30s this afternoon in a coolish airmass, continued southerly flow overnight and increasing and gusty south wind tomorrow will usher in a warmer and more moisture-laden airmass. This will set the stage for thunderstorms during the day Sunday. With the surface low passing well to the northwest of the area, a widespread severe weather outbreak is not expected, however there could be enough instability to bring a few strong storms during the afternoon (see video below). 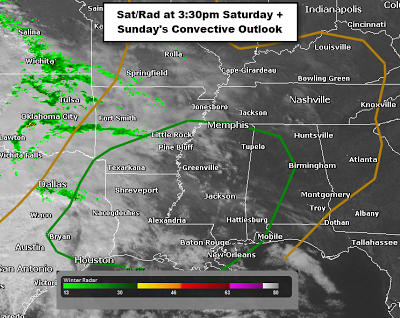 The most likely area for severe storms, as depicted within the green outline is over the Lower Mississippi Valley. Mid-afternoon satellite and radar composite shows clouds streaming into the area ahead of the next trough. 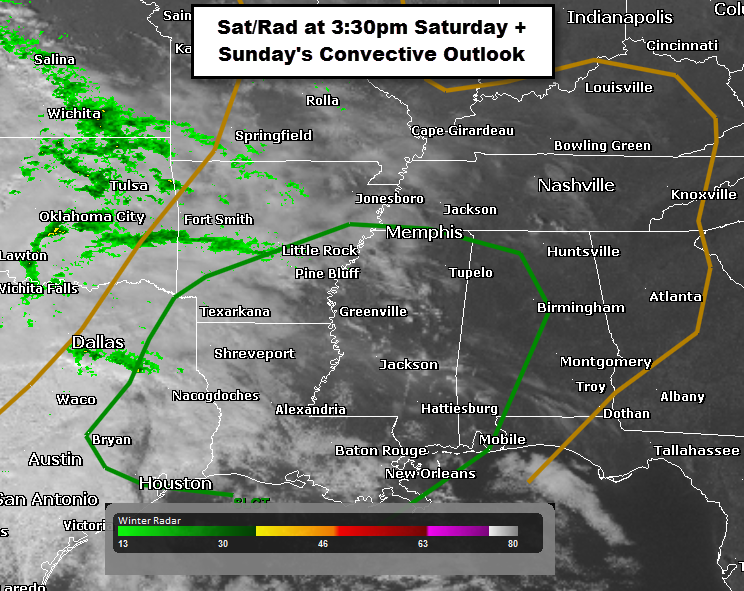 The area outlined in green has a Slight Risk of severe weather on Sunday as a cold front moves through. Storms will be ongoing in the morning over eastern TX and will move across the region with an enhanced risk of severe storms during the day. The northern end of a likely line of storms could be close to the metro, though the meat of the system will affect southern AR and MS where a high wind and tornado threat exists especially in northern LA and central MS during the late morning and afternoon hours. Probability of severe weather on Sunday. The metro has about a 15% chance of severe storms, but a much higher chance of general thunderstorms. 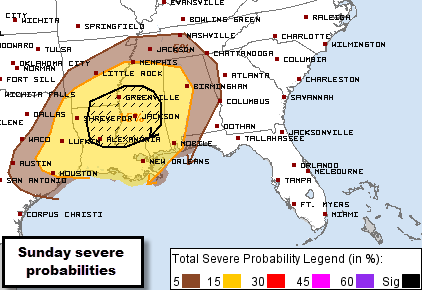 The black hatched area has the best chance of significant severe weather. The main threats with any storms on Sunday here in the metro will be an isolated high wind and large hail threat between 11am-2pm (info updated Sun at 7am), though thunder is possible as early as the morning hours. 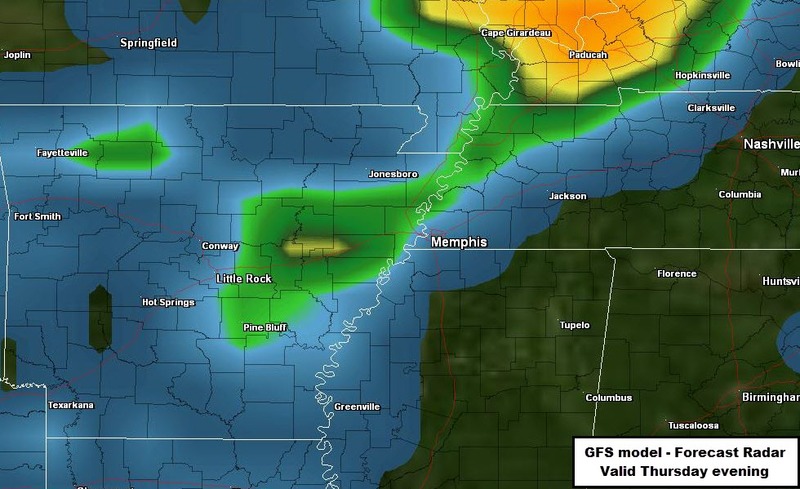 In addition, rain and storms could drop an inch or more of rain in the Memphis area before precipitation moves out Sunday evening. Animation of atmospheric instability (represented as Convective Available Potential Energy, or CAPE) from Saturday morning through Sunday night. A modest amount of unstable air will be available tomorrow afternoon as storms move through the area, though the most unstable air remains south of the metro across the Lower MS Valley. One additional brief note: the cold front that moves through tomorrow will stall out to our south early in the week. An upper-level wave will move through late Tuesday, bringing a chance of post-frontal precipitation. Though upper-level temperatures may support a mix of rain and snow, temps near the surface may be a touch too warm for snow at the ground. The best chance for any light snow will north of the metro on Tuesday night. We'll let you know if anything changes! MemphisWeather.net will nowcast throughout the day Sunday via our social channels, bringing you the latest information on any local threats. Also be sure to download our mobile app for the latest radar, current conditions, and any severe weather alerts that may be issued via StormWatch+. Links to all of our offerings are below. Follow MWN on Facebook, Twitter, and Google+ Visit MemphisWeather.net on the web or m.memphisweather.net on your mobile phone. Download our iPhone or Android apps, featuring a fresh new interface and StormWatch+ severe weather alerts! Temperatures once again averaged above normal, while precipitation was finally well above normal. Drought conditions continued to abate, even though rainfall was below normal. Northern parts of the metro were still classified "abnormally dry" at the end of the month, however drought was over for the rest of the metro. There were two strong to severe thunderstorm events. On January 12-13th, thunderstorms produced flooding in many areas of the metro, while a Moderate Risk event on January 29-30th produced dozens of high wind and flooding reports in our area and a tornado outbreak across middle TN. Icing also created very hazardous driving conditions on January 14th (0.04") and 15th (0.20"). The average temperature for the month of January was 44.9 degrees, or 3.7 degrees above normal. The average high temperature was 53.9 degrees and the average low was 36.0. The coolest temperature of the month was 26 degrees on the 4th and 22nd, while the highest temperature was 76 degrees on the 29th, which also tied a record high for the date. There were 17 days on which the low temperature fell to freezing or below. Precipitation for the month totaled 9.72", which was 5.74" above average and narrowly missed making the top 10 wettest Januarys on record. It was also the wettest month in Memphis since April 2011. There were 11 calendar days with measurable rainfall; 5 recorded totals of 1" or more (maximum 3.78" on the 29th-30th). 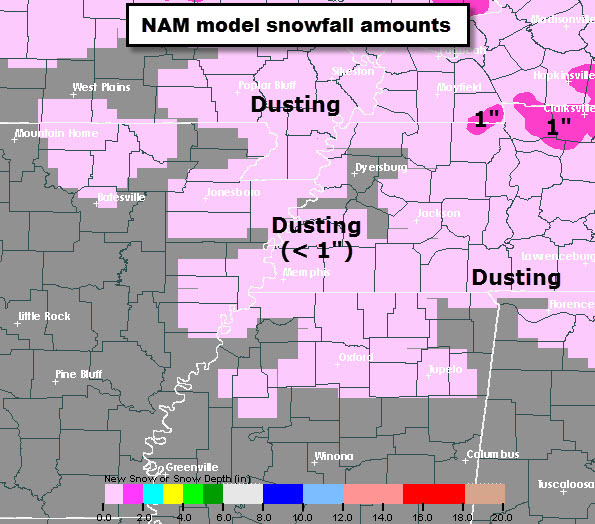 Snowfall totaled a trace on January 14th-15th. The peak wind gust was 61 mph from the southwest produced by a severe storm on the 29th with an average wind speed for the month of 8.1 mph. Click here for a daily statistical recap for Memphis International Airport. The average January temperature at Cirrus Weather Solutions was 42.9 degrees with a maximum of 74.9 degrees on the 29th and a minimum of 20.0 degrees on the 3rd. January precipitation measured 7.84" via the Cirrus automated gauge and 8.79" in a manual gauge used for the CoCoRaHS program (which included 0.62" that fell from the afternoon of December 31 through the early morning on January 1). Snowfall recorded was a trace. The measured peak wind gust was 28 mph on the 30th. Average relative humidity was 78%. Click here for a daily recap on MemphisWeather.net. For the month of January, the average temperature error in all MWN temperature forecasts was 2.80 degrees, lower than all available full-range computer model data and the National Weather Service. More than 56% of the MWN temperature forecasts for the month were within 2 degrees of the actual temperature. MWN's forecasts extend out five periods (2.5 days, or roughly 60 hours). For dewpoint accuracy, the MWN forecast averaged 3.13 degrees of error and fell within 2 degrees of the actual dewpoint over 51% of the time. Historical accuracy statistics can be found here. Today is National Weatherperson Day! For a little history on the day, read the following previously posted by the National Weather Service in State College, PA, home to one of the largest communities of meteorologists outside the state of Oklahoma - Penn State University and AccuWeather. I'd like to echo their sentiments. Thank you all for making MemphisWeather.net one of your trusted weather sources! Your feedback (positive and "constructive") allows MWN to bring you the best weather information available for Memphis and the Mid-South. Social media provides an outlet for instant feedback so that we can refine our processes even during severe weather events and our mobile apps are one more way we can reach as many as possible when inclement weather threatens. We can't thank you enough for following along, downloading the apps, and keeping us motivated! MemphisWeather.net was founded nearly 10 years ago, but our parent organization, Cirrus Weather Solutions, was founded 3 years ago today. 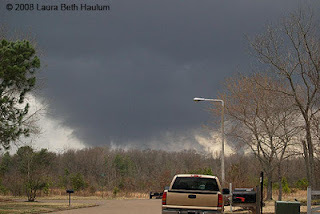 There was symbolism in choosing that day - which was not only National Weatherperson's Day, but the two-year anniversary of the Super Tuesday Tornado Outbreak of 2008 that killed three Memphians and injured many more (click here for our first-person retrospective written last year on this day). We use our platform to do our best to ensure that should an outbreak like this happen again in the Memphis metro, no one is killed or severely injured. Thanks to you for helping to spread the word that we exist for the sole purpose of educating and keeping safe the fine folks of the Memphis metro.